Assault Android Cactus: A new android has entered the ring! A new android has entered the ring! UPDATED - check out our new character trailer! We've recently updated the Early Access build, there's a bunch of improvements and new content, but the most significant addition is we're introducing our next playable character, Aubergine! Earned by beating Vespula, she's the second character unlock and the first new face we've shown since launching the Early Access, Aubergine is a no nonsense ship security officer caught out when her boss, one of the ships Section Lords, turns against the crew. She fights to protect everyone on board the ship, and isn't entirely fond of the green haired upstart that's just crash landed on her ship and started telling everyone what to do. 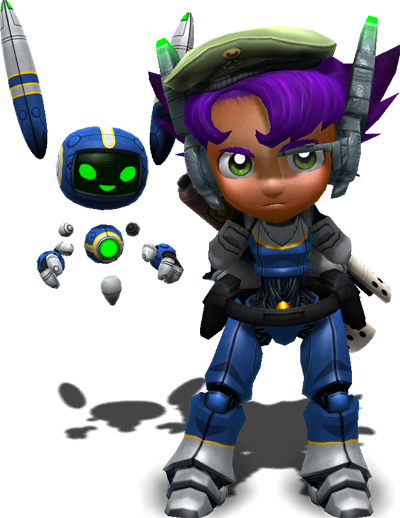 Aubergine's primary weapon is Helo, her personal utility robot who controls a bit like a boomerang mixed with a wrecking ball. 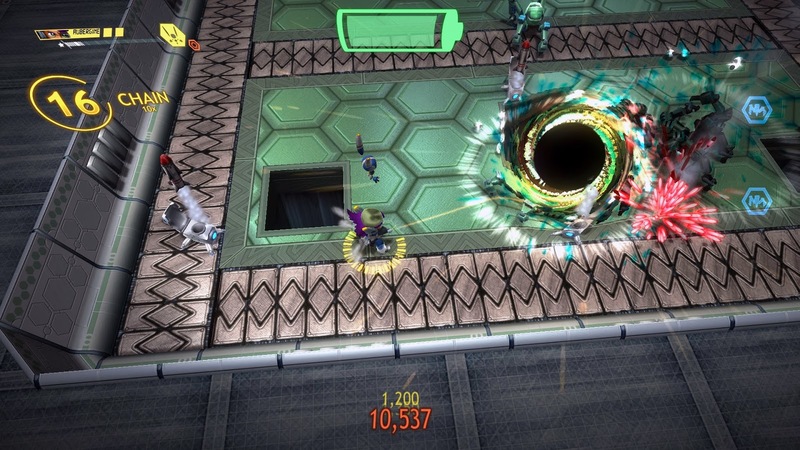 Backing this up is the Singularity Generator, which punches holes in space time then drags nearby enemies in. A powerful weapon in it's own right, it gets even more effective when combined with Helo. attention all staff - rubbish is to be sorted and placed in the appropriate bin, NOT black holes. Stop using the gun for that. Best of all, if you already have the Early Access, Aubergine is playable on Steam right now! Check out the new whitebox levels Centrifuge and Control while you're at it or if you have a PS4 controller, give it a go, they should work for Cactus under Windows, OS X and Linux now! I just wanted to post a quick update about the character, but I intend to cover the making of Aubergine and talk more about why we designed her weapons the way we did in the next couple of days.